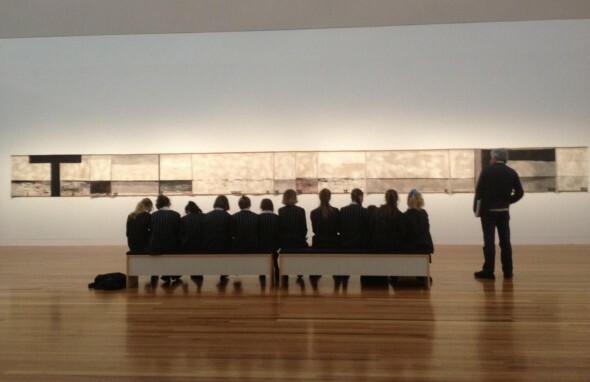 On 12 and 13 May, writer and artist Gregory O’Brien gave a series of workshops to school groups about collaborations between artists and writers, and the ongoing conversation between art and text. I sat in on one. I work at Te Papa as part of the Writing Team, and, as someone who leans a little toward poetry, I’d also been involved in the Walk with Me project. The central focus was McCahon’s painting Walk (Series C), which he painted shortly after the death of his friend, the poet James K Baxter. 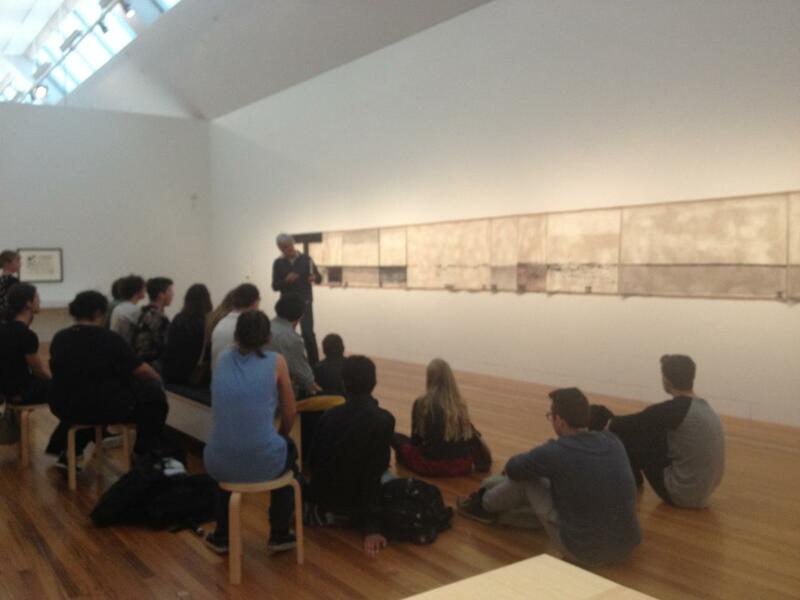 Unlike many of McCahon’s works, Walk (Series C) is devoid of text. Only the word ‘Walk’ captions the middle frame. The painting represents a walk along Muriwai beach, where McCahon lived. There’s a loose horizon line, and sometimes shades of what could be incoming weather, but for the most part the rough canvas is a bleached out haze. The overwhelming sense is of silence, distance, absence. With this as his background, Greg got the students to do the opposite of McCahon and write down the kinds of things they might find on a beach. Everyone then headed to our classroom where Greg showed examples of how words could be used in pictures, and were actually a kind of picture in themselves. 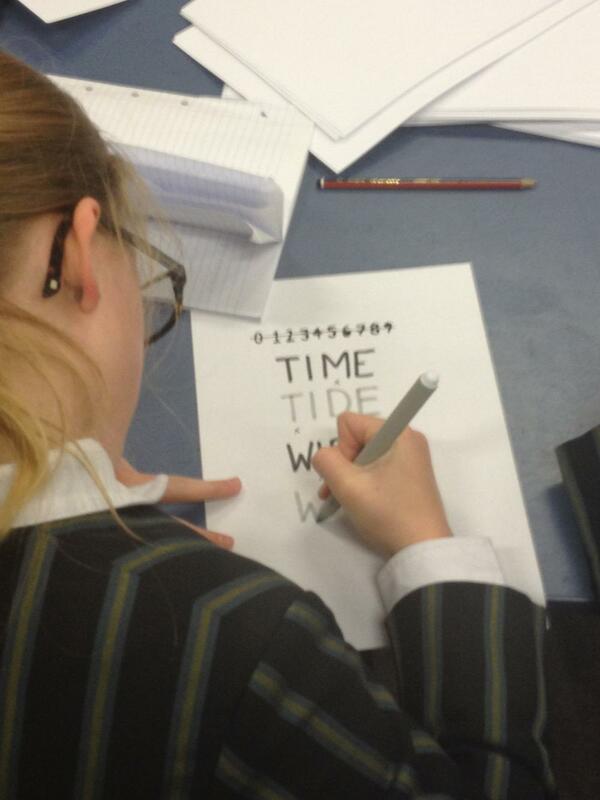 The students were then let loose with pens and paper to create their own beach inspired word-picture artworks. The results were surprising. Suddenly it was OK to doodle or create comic strips or graffiti. Or should that be graffito? – happily spelling was also up for grabs. Objects became their own labels and grew into map-scapes. One boy’s picture contained a firey word ‘Run’, which Greg pointed out was a nice response to McCahon’s ‘Walk’. Another boy had written a list poem, which he stood up and read. The students were then packed off back to school with Greg’s cheerful promise that they would be allowed to continue what they had begun when they got there. Hopefully, for some of them, that engagement with art and text will be lifelong.